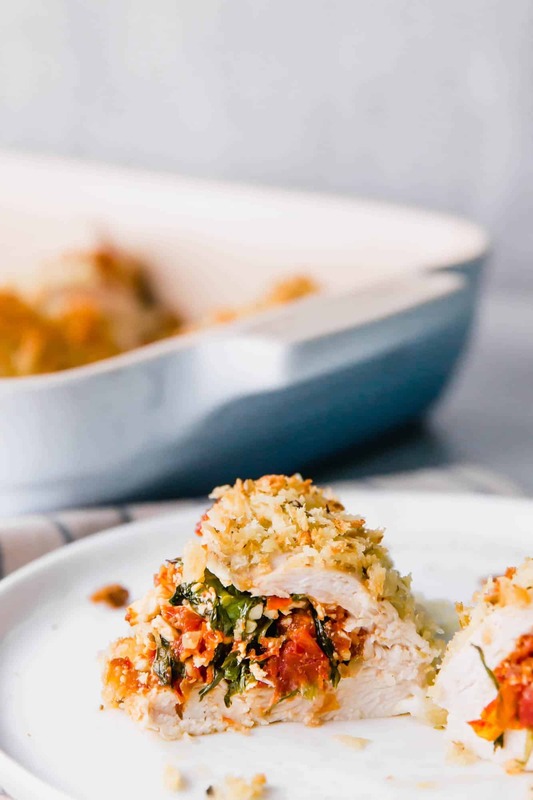 These Sun-Dried Tomato, Kale and Feta Stuffed Chicken Breasts are impressive enough to serve to guests but easy enough to make for weeknight family dinners. You won’t believe how simple and delicious these are! Usually when I develop a new recipe, I’m fairly sheepish about it. I wait to hear other people’s opinions – I ask Ben what he truly thinks of it and I critique it carefully myself. 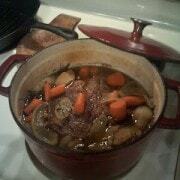 But then there are certain recipes that I’m absolutely confident I nailed. Even still, the recipe has to be really something I feel I knocked out of the park before I give myself a little compliment or let out a “yum” as I stuff my face. 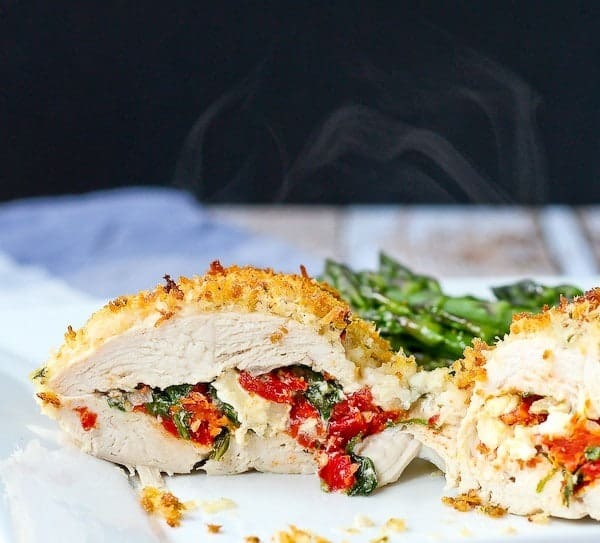 This kale and feta stuffed chicken breasts recipe – hands down, is one of the best chicken recipes I’ve ever made. There may have been a “yum” or two escaping my mouth between bites of this flavorful chicken. 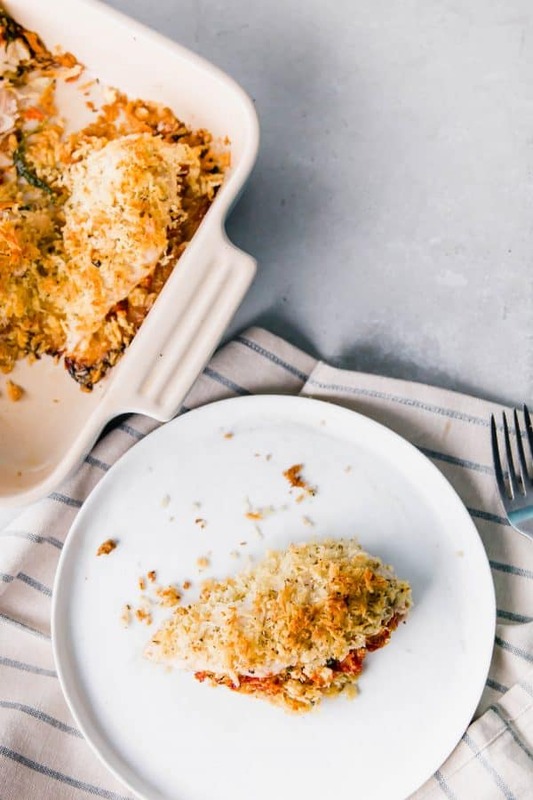 I’m excited to be partnering with Just BARE® Chicken again this year to bring you this recipe as well as a couple other blog posts throughout the remainder of the year. In the spirit of summer, for this recipe I used their new Organic Boneless Skinless Chicken Breast Fillets. I always equate boneless skinless chicken breasts with summertime. They’re lean and perfect for grilling — or for stuffing! These feta stuffed chicken breasts may sound fancy since they’re stuffed but I assure you, just like all my other recipes, these are EASY. The hardest part is butterflying the chicken breasts, but even that is super forgiving. You want to cut them open like a book. If you’re unfamiliar with the technique, make sure to watch the video it this post – it will help give you a visual. But like I said, super forgiving. Even if you accidentally cut them all the way through, you can just set the filling on top of one piece and then layer the other piece on top. Of course if you can, leaving the two pieces attached is idea as it forms a nice pocket for the filling. 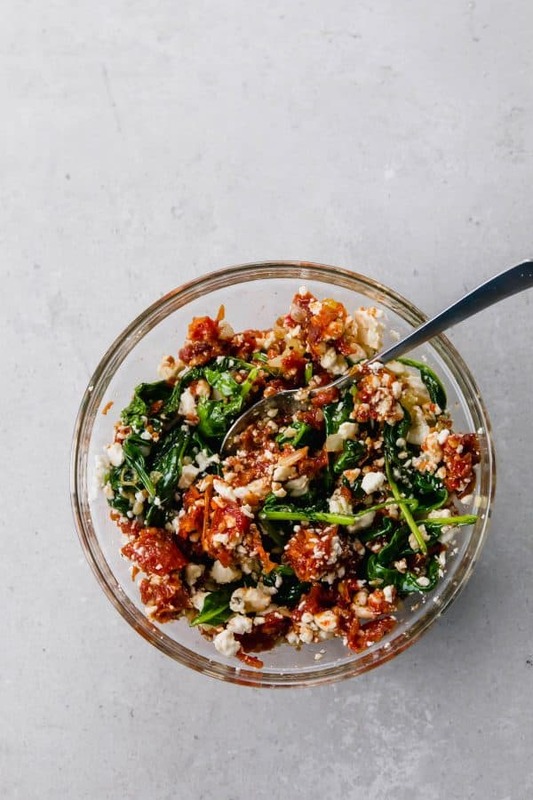 The filling consists of sautéed onions, sun-dried tomatoes (they’re sweet, chewy, and add great color), baby kale (chopped kale would work too), and salty feta. Tip: Can’t find, don’t want, or don’t like kale? 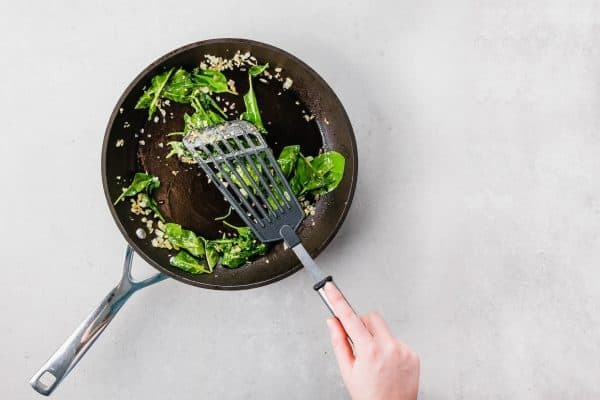 Spinach works perfectly in this recipe too. Spinach and feta go so well together! The filling is super flavorful and nutritious but it will feels rich and decadent. Here’s how I do it to keep things really simple. I butterfly all the chicken breasts, leaving them on the cutting board. I spray my baking dish lightly with nonstick cooking spray and set the first chicken breast in the pan. I fill it with about a quarter of the filling and then fold over the other half of the chicken breast. I repeat this process until they are all full of stuffing. That way you don’t have to transport them to the pan after you stuff them — if you do that, you’ll lose a lot of the filling trying to move them. Once they are all stuffed and in the pan, you sprinkle your Panko breadcrumb mixture over the top and bake! It’s SO easy. And yet so impressive. These are perfect for company because you can prep them and while they bake you can worry about the rest of your dinner (or just sipping on wine with your guests!). They’re perfect for weeknight meals too because they’re that easy to make and so good that you won’t want to save them only for special occasions. Stuffed chicken is always such a fun and fancy dish, like these apple gouda stuffed chicken breasts that are so silly easy but look fancy and taste even better, or this Hasselback Chicken with spinach and artichokes that uses a slightly different stuffing technique. I look forward to trying a few of my friends’ recipes like Bacon Cheddar Ranch Stuffed Chicken Breast from Wine and Glue, Enchilada Stuffed Chicken Skillet from The Cookie Rookie, or Jalapeno Stuffed Chicken Breasts from Spend with Pennies. Which one would you try first? I’m ready to dig in….are you? If you’re looking for MORE great chicken recipes, here’s what I’ve made with Just BARE in the past: Chicken “Burgers” with Leeks, Gouda and Bacon, Chicken Caesar Tenders, Slow Cooker Moroccan Chicken Thighs with Butternut Squash, and Chicken with Blueberry Chipotle Sauce. 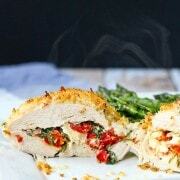 Watch this short video to see how to make these Sundried Tomato, Kale and Feta Stuffed Chicken Breasts! 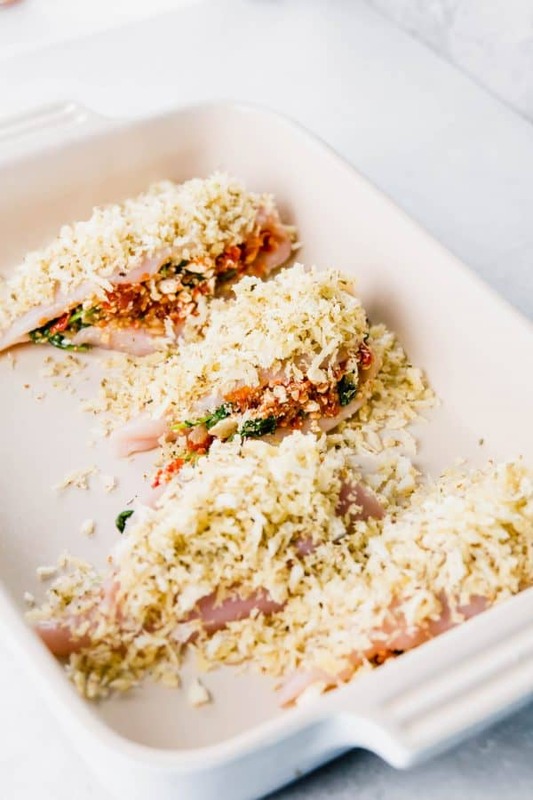 These Sun Dried Tomato, Kale, and Feta Stuffed Chicken Breasts are impressive enough to serve to guests but easy enough to make for weeknight family dinners. 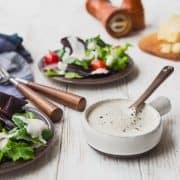 You won’t believe how simple and delicious these are! Preheat the oven to 425 degrees Fahrenheit. Heat olive oil in a medium skillet over medium heat. Add the onion and cook until softened, 3-4 minutes. Add garlic and cook until fragrant, about one minute. Reduce heat to medium low and add kale and stir until wilted, about 2-3 minutes. 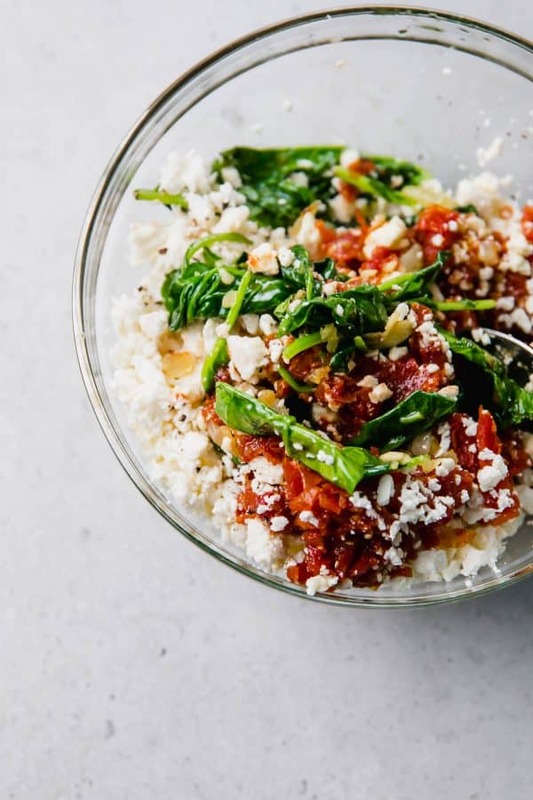 Transfer to a bowl to cool, then add the sun-dried tomatoes and feta and season with salt and pepper. 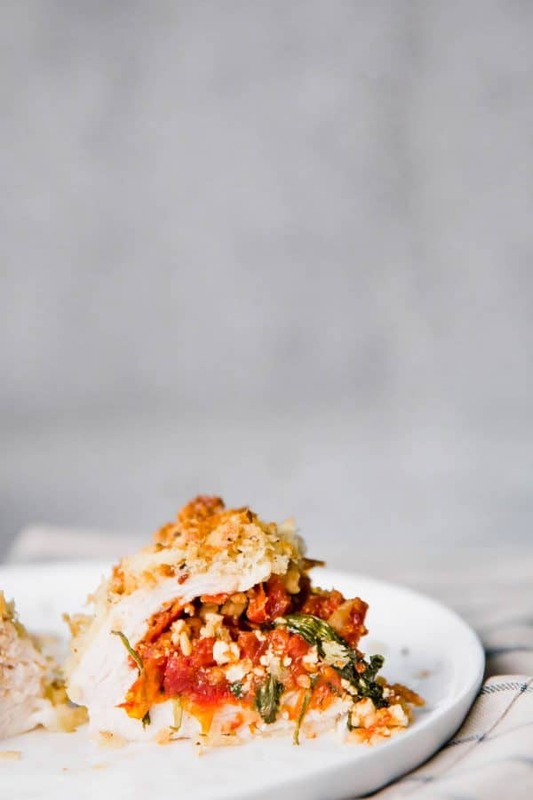 Melt the butter in the same frying pan over medium-low heat, turn off the heat and add Panko breadcrumbs and oregano. Toss to combine all ingredients. Spray a 9×13 baking dish with nonstick cooking spray. Split each chicken breast across but not through and open like a book (be careful, you can easily cut yourself doing this!). This is also known as butterflying. Place in baking dish and stuff with sun-dried tomato mixture, letting the stuffing overflow at the edges if needed. Top with the panko breadcrumb mixture. Bake until the juices run clear and internal temperature registers at 165 degrees Fahrenheit, about 25-35 minutes. 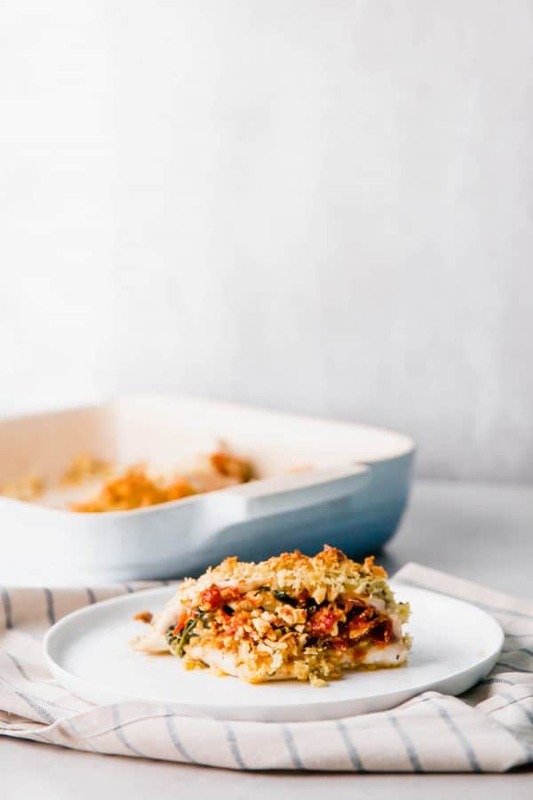 Verdict: Oh gosh – I don’t think I need to further explain how much I love these sun-dried tomato, kale and feta stuffed chicken breasts! I’ll definitely be making them again and again. Husband’s take: He was 110% on board with these – he loved them. Disclaimer: I have been compensated by Just BARE chicken for the time required to develop and share this recipe for feta stuffed chicken breasts but all thoughts are my own, as always. Thanks for supporting my blog by reading about brands and products I use and love in my own kitchen. Post updated with new photos and video 1/8/2018. For fun, here are a couple of the old photos! Sun dried tomatoes and kale sound like a perfect combo!! I plan on making this tonight! Should I cover the baking dish while its in the oven or should I leave it uncovered? If I make this without the panko will it be okay? Such great flavors in the filling, I know my family would love these! Already dreaming about this for dinner! A party in my mouth is what this recipe is! Love everything from the kale to the feta. Really outstanding! This filling is amazing – I can’t wait to try this recipe! Your filling sounds epic! So pretty, too! These look fantastic Rachel! My stomach is rumbling! Made these last night and the family loved!! My husband asked if they were pre-made heat ups because they looked so perfect! 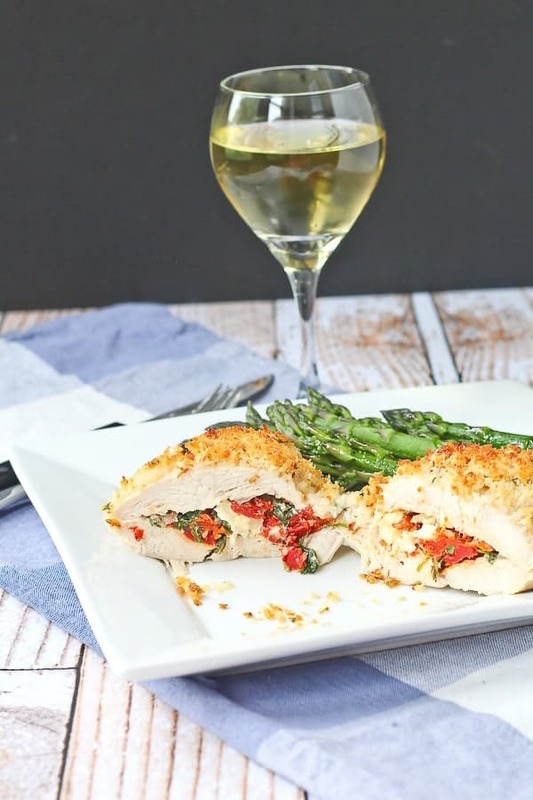 Stuffed chicken is such a great way to impress yet it’s so easy to do! I’ll have to give this a try next time I buy kale. Oh man do these look super delicious!!! I love how they are easy to prepare but impressive for company!! I love all of the ingredients and it looks amazing so I’m pinning and will give this a try. Always looking for new things to do with chicken. Looks so delicious and juicy! I’m wishing you were my neighbor! This looks delish!! Whoa – this looks and sounds incredible! I need to keep my eye out for the Just BARE chicken. That looks worthy of a high-end restaurant! Wonderful recipe!